Get a massive 56% discount on website hosting, plus access to my $500 course bundle. Here are all the resources that you need to build this awesome new website. Building your website will be easy with the video tutorials. I want you to succeed. What Makes This Course Website So Great? When choosing the best free WordPress theme, I always go to GP. It's lightweight, rock solid, and currently has over 700k downloads. The homepage was built using the most popular front end page builder, Elementor. It makes building gorgeous page layout, easy. Currently the most advanced and feature rich learning management system for WordPress, and it's what I personally use. Can I use X payment processor to take payments? If you watch the video on ecommerce, you will see how to integrate WooCommerce with LifterLMS. WooCommerce is integrated with just about every payment processor under the sun. I thought you said this stuff was for free? its not. Awesome template bro! I love your website, I love learning from you! I thought you said this stuff was free? its not. You heard correct. You are mistaken. Hello, thank you for the free tutorials. I am trying to import the Elementor Templates (json) files and having no luck, I select them and the import fails. I have freshly downloaded the Resource file in case of recent updates and no luck. My hosting site is in hosting. TIA for your assistance. Who are you hosting with? I would suggest using one of my recommended hosts. Thank you for the free tutorial. I’m at the stage for importing the templates you provided into Elementor, however, the .json page templates will not import. I select the template and hit the “import now” button… template appears to be importing but when the page refreshes the template is not there. Same result for all 3 templates. I noticed that the Elementor menu on the left side is different from the one in your video. There is no “my library” button. There is a button that says “my templates” and I used the template importer button from there. The last modified date on your templates shows as 03/2017, obviously lots of wordpress and Elementor updates have occurred since then. Is it possible that the templates you provided are no longer compatible due to the updates? Fyi…my current host is Hostgator. Yes My Templates was renamed to My Library. But it should import perfectly fine. Personally, I don’t recommend Hostgator, but every time someone has said they have a problem importing, I go and retest importing and never seem to have an issue. Hello, would you happen to know what the deficiency is that the non-recommended host have that keeps the json files from importing is? I contacted Hostgator to troubleshoot the problem and was asked this question as they did not detect anything that would cause the file not to import from their end. Plugin compatibility and php issues have been ruled out. Usually its a lack of memory given to each account. 100% you can use whatever hosting you already have. And yea, this page has some issues, I am going to be reworking it. After adding LifterLMS in astra theme the mobile menu disappears. Please help me. You can reach out to Astra support. looking forward to learning how to create a website for the online courses. i want to go to the end this time, after starting and not finishing for years. i’m inspired by your videos and been watching them the past few months. and really appreciate your appsumo reviews and bought everything you recommended. Thank you so much Miranda! You can do this, you got it! Hi, thanks for offering such a great tutorial. One thing, I’m building my website on the OceanWP theme where the course will be on a page on the website. Does the theme matter? Hey so the theme does sorta matter. For this tut I had something special built for GeneratePress and in my most recent version of this is using Astra. Astra has styling integration with LifterLMS so it will require less effort to make it look great. Thank you for the free course. Where can I find the DFY template file for this online course website? It’s not distributed that way. That was the 2016 version which is no longer available. Thanks Adams. So how is it done now? There is a link right here on the page to the latest version. thank you very much for the free course. Here can I find the DFY template for this online course website. Thank you so much for this information! It is clear and instantly valuable. I have a question about sub-domains. 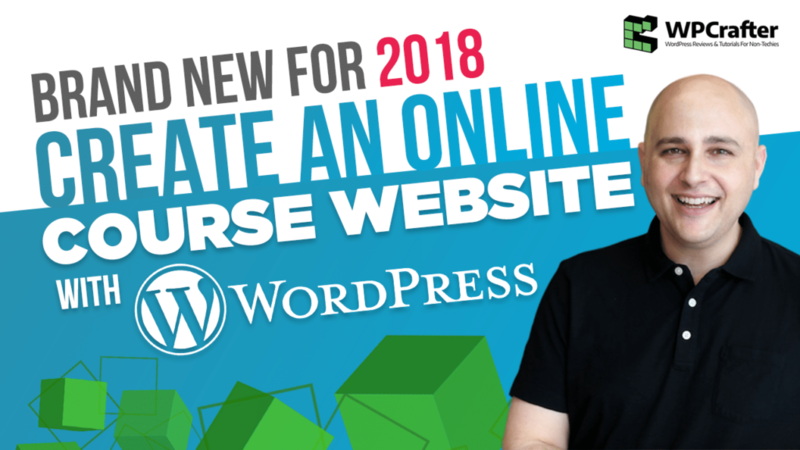 If I wanted to create a course website following these instructions, and I already have a domain (used for WP blog) and a host, would I need to install a new WP instance to build the course site? Also, I would like to use a sub-domain instead of purchasing a new one (ex: course.blog.com), is this possible without altering my current blog’s design? Yes if you wanted to have another WordPress install on a subdomain, you certainly can. It won’t interfere with your main site at all. Wow! I just found you! Awesome information. I’ve watched a couple of your videos and have been checking out your website. I appreciate all the great valuable information that you’ve given for FREE here! Thank you! I will be going to YouTube LIKE and follow you and SHARE your information and comment on YouTube too! I have a couple of questions. I currently have a WordPress / WooCommerce site that I created on my own a few years ago and it definitely needs some work and updating! I am definitely not tech savvy but do not have much $$$ to spend on having someone do everything for me, plus I like learning and having the knowledge and ability to make changes whenever I want. I have a brick and mortar Gluten Free Bakery business (www.chamberscreekkitchen.com) and sell physical products but would also like to create some FREE and paid online cooking type of courses and some digital cookbooks, etc. I currently have my Hosting with Hostgator and wondering if you feel that it would be beneficial for me to switch to InMotion Hosting and why and assuming that you’re going to recommend switching do I sign up with InMotion should which version would most appropriate for what I’m wanting to do: WordPress OR Business Hosting???? (I’ve been checking them out from your site here….) Before watching this video I watched the one you just put out in January of 2018 about creating an ecommerce store. I was just about to switch from my Headway theme to ASTRA, when I decided to watch this video on courses first. SOOOO….. Second question is WHICH theme would you recommend I use in this case? I originally found you as I clicked on your video that you did on YouTube comparing Wistia, YouTube and Vimeo for adding videos to my website. Thanks again for this great content! And I pray for you that What goes around Comes around! You should follow the 2018 version of this video series. It’s based on Astra. I still haven’t added a proper post for it here on this website. You can try with your current host of you don’t want to change. Thank you for the invaluable courses that you provide to your student members as well as the online YouTube tutorials that you have created. I am working my way through the 5 hour Elementor tutorial and have completed the member course on Elementor. How can I obtain the Elementor course template which you offered in your tutorial? Thanks for all that you are doing to help make more efficient use of web technology. It’s in the resource package that you can download on this page. Right under the video at the very top, there is a button to download it. However, that is for the 2017 version. If you are referring to the 2018 version, there was a link in the video description on YouTube. Hi Adam. Thank you for this great tutorial. I think you chose LifterLMS because it has an excellent and full-featured FREE version. However, if you want to make money you have to pay $99 for Paypal and/or $99 for Stripe ($198 total) per year. And its add-ons rapidly become very very expensive. For $159 you can get LearnDash with Paypal and Stripe and Woo Commerce for free plus you have the option of using Membership plugins like MemberPress, Restrict Content Pro and PaidMembershipsPro if you want these to handle payments. So if money is not a concern (at a reasonable cost e.g. < $200 a year), what advantage does LifterLMS have over LearnDash in your experience? For me that was not the reason I choose LifterLMS. I used to use LearnDash and later switched. It’s easy to look at all the paid extension for LifterLMS and think it is more expensive, but it’s not. All those extensions are not even options for LearnDash. It’s hard to have a real apples to apples comparison, but Lifter + 1 $99 payment gateway is more powerful and feature rich than the paid version of LearnDash. That being said, I am working on an in-depth comparison. Hi there, are the page templates still not able to be used? I have tried uploading but no templates are showing. Who is your host? The only host I have heard where people have had some issues is GoDaddy, which in the video I strongly urged against using. Ahaaa! the culprit. If I move over my domain name, along with 3 different applications and a sub-domain, am I at risk of losing content? I am not sure I follow the question there. If you properly migrate a WordPress website you will not lose any data. Hello Adam, Thanks for the amazing work. It’s really helpful may you be blessed. for the quiz there is no field to add it, can u help me please? Hey, I am not following you there. Since releasing this video series LifterLMS has updated their course builder. If you look at the last video in the series, I go over that. First of all, thank you so much for making this online training! You helped me a lot! I have two questions. I can’t seem to change the text ‘Sign out’ on the members dashboard. I have translated everything else but for some reason I can’t seem to change the text from ‘Sign out’. I have searched on it and changed everyone single one I found but it still didn’t work. Can you help me with that? My second question: Is it possible to change the tabs in the members dashboard? For example I don’t want to display the ‘Redeem a voucher’ tab. Is it possible to hide 1 or more tabs? Like to hear from you. Thank you in advance! Regarding changing the text in that button, you may need to reach out to LifterLMS to let them know there isn’t a way to do that. Maybe it was overlooked. Regarding removing tabs, I don’t think that is possible. For changing the text in that button I will contact LifterLMS. Regarding removing the tabs, I really need that so I kept on searching and I succeeded. On the following page I found the way to change it: https://lifterlms.com/docs/lifterlms-filters/#llms_get_student_dashboard_tabs. Dear Astrid, I also wanted to remove 1 or 2 tabs. I tried it the way you mentioned but I did not succeed. Did you succeed by copying the filter as mentioned above? Thanks in advance! Well, you are not understanding what is happening. When you click on the link in the email, a page opens in your browser and the download immediately starts. Check your downloads folder on your computer, I am sure it was downloaded and is there. Is LifterLMS’ Stripe plug-in also under GPL license, like the PayPal plugin? Do you think there is any difference using it vs. PayPal? It is. Most of the plugins and themes available for WordPress are GPL licensed. Hi Adam…first thanks so much….wondering do you have a discount for inmotion for the reseller VPS? Your welcome on the content here. And regarding the reseller account, I have tried but the current discount offer is the best I could get. Thank you for all your videos. Indeed your videos are very valuable and if you had charged them I would still pay. So, thank you. It was because Astra wasn’t released for several months after. That being said, I am remaking this video series in January and it will be based on Astra. Does that mean you changed the theme on your site from GP to Astra? Was it an easy change? I have the premium version of GP and I really really hate changing themes. Well if someone that went through the 2017 version wants to change to Astra Theme, it’s not that hard to do. Astra makes it really easy. And yes I am using the Astra theme here on this website. You can email me a copy of the receipt and I can check with them. i have categorized users that i want to show only courses based on the category they belong not all course, is this possible? I don’t fully understand how you want to do this or a example of why you would. You can use the shortcode they give you to display only what you want. Also, in the members dashboard people will be able to see what they are enrolled in. Hi Adam, Thanks for this amazing series. I have some queries. Can we do this with Astra instead of generate press? Could you help with child theme of astra for the same in resource section. As new year is round the corner, will this course get major updates in 2018? Yes I am working on this right now. The 2018 version that I will release in early January will be based on Astra. Thanks Adam, Also if you can elaborate this time on payment system. Please help how to use credit card on payment gateway or any free plugin for woocommerce integration with lifterlms, like the one for Paypal you have given(awesome plugin). I am a Indian Business, Stripe or Authorize.net is not a option here, unfortunately lifterlms can’t help. Since Stripe and Paypal are not options for you, LifterLMS offers a WooCommerce integration for $99. this will enable you to use any of the WooCommerce payment gateways. does something change with Download Resources button? Currently, it currently re-directs to this page. I had anticipated a ZIP file that gets imported into the WordPress replacing the existing install. If not – that’s AWESOME! Yea the 2017 version is not like that. It won’t wipe out your website! Adam … great job! I’m a YT subscriber but wondered something. I’m currently building a LMS website with LifterLMS and DIVI and I am thinking of using your affiliate link to switch to InMotion and your DYT template. Is there a way to keep the work I’ve done in LifteLMS and transfer to the new installation? For example … all the lessons have quizzes, prerequisites, and excerpts completed. I’d hate to re-do all of this! Any options? Yes, you can use the same install and just change the theme. Everything will be retained, but with a new fresh coat of paint :-)! Unfortunately, this is a current bug in Elementor that they are working to fix. An update should be out soon. Hi Adam, wow your content is awesome After watching and working alongside your 2017 training course, I know I finally headed in the right direction. Starting from the ground up with your program is the way to go. Thanks so much for your awesome video! Need your expertise for the student enrolment how do I remove the field and if I need to upload student picture in the student enrolment . Which video related to these ? Not sure I fully understand your question, sorry. You want students to upload a picture? That is not an option, but the way WordPress or all websites get your photo is based on something named a Gravatar which is linked to your email address. Hi Adam, I really like the way your lesson viewing area looks compared to the stock Lifter layout which looks more like a blog post. Would I be able to use your layout/child theme if I’m already using GP on my site? I would be adding Lifter to an existing site, not starting a new site… Thanks! Hey Mike, if you are referencing the one on my website, I built that using Beaver Builder and Beaver Themer. Since you are using Elementor, the same can be done with Anywhere Elementor Pro which allows you to create custom templates. I have followed the this course completely however when time some of the pages ar overwritten by lifterlms like my courses page, and memberships page. do you know how to prevent it from overwriting I even reinstalled lifterlms and skipped the produce pages and still a similar issue is there a code that’s required to be place within the fuctions.php or other location to prevent the defaults. I have the fullwidth etc as well however it isn’t serving to thanks beforehand for any info on this. Sadly, I don’t understand your question. I’m in. I’m creating a course to help students keep their faith while in college. Wow, that’s a great course to make because that is typically where people veer off. Hello Adam, I would like to know is it legal to change footer credit of the Free WordPress Themes like GeneratePress, Zerif lite and Hestia. You should read up on something called the GPL. It clearly spells out how all WordPress products are licensed. Essentially you are allowed to change any code, give it away for free, you can even resell it. Awesome! Let me know if you need any help along the way. I’m having problems with the child theme. Firstly, I have text at the top of my page that says “I didn’t exercise today, that’s okay, you’ll do it tomorrow.” “I didn’t meditate today, quick do it now it takes 5 minutes.” I tried editing the page with elementor and elementor doesn’t start up. It just has a completely blank screen with no controls or anything. I don’t know what to do. That wouldn’t be caused by the child theme. Who is your web host? Hell Adam. Thank you for the DFY templates! I am updating from the 2016 version to 2017 this weekend. awesome work!! Question: Aroind video 16 of your series you talked about turning “comments” off on your lesson and stated that you would later talk about a plug in that allows people to ask questions, give answers and upvote and such. but…. i didn’t see you come back and touch on that in the remaining videos. Did I miss it? Is it in a different video? I would love to learn more about that so I can get rid of BB Press forums on my site. Thanks! Expect a video tomorrow on that. I should have posted it sooner. Thank you so much for these wonderful videos! I’m too far in with a WHM/hosting situation to change (I think). Not sure if you have videos on WHM, if you do I’d love to know about them, my confidence could be higher, but I get by okay. I am currently moving a course I had on ruzuku to a site of my own. I installed and started working with the lfiterLMS infinity bundle, to use with convert kit, private areas, and other addons. Hopefully, a video on those addons will be coming (?). Divi is a theme I use often but I like what you are training here with elemantor, so I will give that a go following your lead. My course (psy/coaching) helps people learn how to cope with significant illness and disability. Given I have lifter/convert kit addon – is the SMTP plugin still needed? I use manageWP and its plugin for many sites to be notified when updates and comments are pending and wondered if you think updraft plus would conflict with it? I do like the idea of a backup going to dropbox. Your video training is top notch! As host changing is not on my radar is there another method to pay you, I feel guilty as you’ve done so much work? Hey Susan. You know if you have Divi, and like using Divi, you can use that with LifterLMS. It’s just my video series I choose to use Elementor partially because it is free, but even thought elementor is free, it is excellent. To answer your questions, yes you still need SMTP because even though you may use ConvertKit, that is not for transactional emails. You can’t use it for say a password reset email or things like that. Regarding ManageWP, I think it has a backup solution built in, so if you have that you don’t need Updrafts. Other than that I wish you the best in creating your online course! I’m here if you need me. Thank you for your helpful reply. True I could go with Divi, but I have to say I really like your elementor video with the lifter. I did sign up in the big circle opt in – but did not get the resource files automatically as shown in your video. I did get 3 emails, one with link to 3 steps course, one to members dashbaord, but no resources. I think I read on another comment, that re signing up won’t help. Was hoping to follow along with your series. Let me know if I did something wrong? Looks like it was a little delayed? Are you all set now? yes everything is all set. I have been following your videos to the T (on #12) using elementor and I like it much more than divi – Your videos are really really good and easy to follow. I am buying the Pro eliminator to keep with the series. Hope to have my setup in place in a few days – will report back. You a terrific resource thank you again. Opps! I just got the resource files – thank you! I am from Bangladesh! looking for your guidence I have recently understand all the features of wordpress with your help and have made about 5-6 demo websites with elementor. I’m one of your big fan from Bangladesh,thankyou looking for your help! Happy to hear my tutorials have helped you build websites. I think that is a great plan. Also, take a look at the Astra Theme which has prebuilt websites. They should import just fine. Who is your web host? Of course you can, over 50 people do each day. I would suggest trying in a different web browser. Sounds great Scott! Let me know if you need any help along the way. Their documentation was right on point ???? Thanks for sharing your knowledge on your videos! Your welcome, and thanks for visiting their site for deeper answers. Hi, would be nice to see a LifterLMS and Lerndash side by side comparison on your YouTube channel. I do have both and will do that. Thanks for the videos, I think they are going to be of great help to new users of LifterLMS and will help beautify the standard setup on our deployments of LifterLMS. I use LifterLMS on our Intranet but the theme I’m using, GovIntranet, doesn’t support the sidebars. I’m thinking of moving to OceanWP theme (http://oceanwp.org) instead of Generatepress since it already have mega menus, sticky header, etc., in the free version. This one also lacks support for the sidebars. Can you point me in the right direction to enable them like you did on your Generatepress child theme? You can learn how to integrate sidebars on the LifterLMS website. Just visit their documentation. I have one request to you about Lifter LMS. Can you make video tutorial in YouTube how to setup Lifter LMS with Woo Commerce integration so that I can use Woo Commerce collection of payment gateway. Thank You in advance. Yes I can make that video. I am loving the course and am on my way to setting up my own now. I was wondering if you could email me the course resources to … since I already have a hosting account i bought 6 months ago. PS, sent a $10 tip your way through paypal because I feel as though i should have paid at least $100 for this awesome course. Hello Adam, I am using the wp multisite option since I’m planning to have many teachers on my network. I have installed and erased this site three times and this last time I decided on the wp multisite option. The reason I erased the installation is because I spent a lot of time and attempted everything you teach on your videos about the LifterLMS and it kept overriding the pages and menu. Now with the multisite, I didn’t get a chance to set up LifterLMS it just installed on the network and now it doesn’t display the menu. I notice that when in customize section on Lifter the Save option doesn’t save it just stays as “Save & Publish” the same thing happened when I used the single site option for wp installation. I did see that another gentleman asked you about the same Lifter overriding and you referred him back to your video. I strongly recommend against using multisite. It is nothing but trouble. I am Jonathan and I want to use this amazing opportunity to build my course website and support people on their personal healing, awakening, and conscious development (psychotherapy, holistic health, meditation, bio-decoding, mental and emotional deprogramming, etc….. However, I have my hosting with Arvixe Web Hosting and my service period will come to and end until April 2018. I’ll be able to switch to inmotion hosting then. Is there any way to get your bundle for the online courses for now so that I may continue to use your offering ? I do promise to change to inmotion so the course bundle offering may come to a balanced state for you. I have been intending to build my online coaching practice ever since 2014 and I have not been able to finish my website and make it fully functional. I occupied a lot of my time in practicing with many templates and I’m a bit comfortable with website building until I get to the advanced technicalities that I am simply not aligned with. Thank you for your amazing service and support ! Happy to have you go through the training, however I can’t give you access to my paid courses if you haven’t paid for them. I have followed the this course completely but after time some of the pages are overwritten by lifterlms like my courses page, and memberships page. Do you know how to stop it from overwriting I even reinstalled lifterlms and skipped the create pages and still the same issue is there a code that is needed to be put in the fuctions.php or other location to stop the defaults. I have the fullwidth etc as well but it isn’t helping thanks in advance for any info on this. Well if you are using pages that are assigned to LifterLMS, then it will take over, this is normal. If you go through my 2017 course, you will see that I don’t use the pages that are assigned to LifterLMS and I specifically address the issue. Deeply sorry about that. I am making some massive changes here behind the scenes, and you pointed out something that I missed. Thank you very much. Resource files don’t have the import files to be used with the all in one wp migration as shown in video. The instructions say to see the video but that is of no help if the actual import file isn’t present is there something I am missing. Yes there is, there was a notice on the 2016 version page that it was been retired and this is the new 2017 version. I thought that was clear via the notes, but will have to go and maybe make it more obvious. When I go to appearance >customize. I’m not given an additional CSS option. Is there somewhere else I can put the coding to achieve the same result? You need to make sure you are using a current version of WordPress. Your welcome, and thanks for taking a few minutes out of your day to say that! I am very sorry, this is now resolved. Please try again. Hi Adam, I just buy a Elementor plugin which is $49, how do I get the course you offer on your site please? Thanks. Hey, Adam. God bless you buddy. I need to get that VooPlayer through you but your button is taking me to a page not found tab. Do you have the link I can buy this at this price from you? Unfortunately, I need to remove that because I don’t have any licenses. I would hope to have more in the future but I really should remove that until I have more. Hello Adams, i really appreciate all your effort, you have really shaped my skills, pls what free plugin can i use to move my wordpress site from localhost to live host? For this you would want to use all in one migration. It’s free and works very well. Adam, I’ve figured out how to add Woocommerce using Elementor, but, I can’t seem to figure out how to add my blog using the Elementor page builder to my website. May I ask how do I add m blog to the course website? I mean, do, I just set up regular blog posts within WordPress (probably purchase GeneratePress for better blog building features) but then, how do I get the posts to show up on my Website using Elementor? I have tried looking all over including Elementor’s video helps to figure this out and I’m just not finding it. Thank you! This is actually quite easy to do. You can create a new page in name it whatever you want, or just name it blog. Then you would go into the reading settings of your website and tell WordPress that this page you created is going to be for your blog. You get there by going to settings and then clicking on reading options. I do think I have a video on it but I’m sure you’ll figure it out from there. Hello, Adam! I’m going to have a store on my course site as well, so, I reckon the best plugin for that is Woocommerce. I’ve already installed it. I want to purchase the Elementor Pro with that and start building the store with Elementor, especially since Elementor has some nice Woocommerce page building features. My question is, is it then necessary for me to get a Woorcommerce child theme ? I think if I’m going to be editing Woocommerce all in Elmentor, then that means anything I do with your Elementor child theme and I won’t have to do double duty getting a separate Woocommerce child theme, correct? No need for a WooCommerce child theme. If you are using GeneratePress, that will be all you need. Also, I know that GeneratePress is about to add a TON of WooCommerce features soon, like really soon. I will be doing a video on it this week for sure. Yes I followed the video and I have installed the generate press theme and I have downloaded onto my computer your wpcrafter files but its from there I cannot seem to upload those files to my site because it says……… The theme is missing the style.css stylesheet? Yes, but what exactly are you uploading? The child theme is zipped, it should be zipped with you upload it. This is why I am asking exactly what you are uploading. The exact file name. I can’t seem to install your files because it says – The package could not be installed. The theme is missing the style.css stylesheet. Can you please explain what is it I’m doing wrong why I cannot seem to upload the wpcrafter customised theme. I already have Generate press uplaoded no problem. Did you follow the video where I FIRST installed the GeneratePress theme? Opps…it looks like you did. Can you confirm? Also what is the name of the file you are trying to upload? I am in! I started watching your 2016 videos and then I got stuck on choosing hosting (me and my students are all located in the Nordic countries and I wanted something local, but also something that was not too expensive, not to limited, and that could explain things for a non-techie like me. Didn´t go so well  but I think I am getting there). But I have realised that I really like my ideas for online courses, so now I am back and found your amazing 2017 version. Thanks so much! I am a total beginner on everything to do with an online presence – from creating my business website to including this template for online courses – so this resource is really, what I need! (The courses I am setting up are for beginning university students who need support in academic reading and writing or for teachers who want to add that kind of support to their courses). Wow Karin, I really hope the videos help you make this happen. I put a lot of effort into explaining every step yet leaving options for people to create what they want. I just recently found out about you and wow. I had been using Tesseract for the last 4 years and bought plus back in December. Wow did your one video really clear up some confusion. Well now I’m learning how to use generate press with Beaverbuilder and I am now a raving fan of yours. By the way, do you have a video on how to save a wordpress site as a template that can be sold? I’m trying to learn how to design from scratch and how to use a child theme to make a new improved theme. Have a great one and thank you for opening my eyes to the shady stuff Tesseract is doing. Hey Carl, I am so happy to have you here! I like having doers here, that make things happen. One thing I used to do was design an entire website, then use a plugin called all in one migration to create a backup and distribute it. This way you can sell completely done websites. Hello Adam. I’m having a little difficulty with the theme colors. The link hover color is pink and my course buttons are pink. I changed the color in Appearance, customize and the colors tab in the back end. However, that did not change it. I also used your CSS code provided in the resource files but removed and replaced all colors you originally had to my own colors. I verified this and re verified. I’m not sure what to do to change the link hover colors and the default pink buttons. The buttons change to blue when you hover over them. Those theme colors are in the functions file of the child theme. I did talk about that in the video where I set up everything in the customizer. It was towards the end of the video. I believe that message is when you are running a very outdated version of PHP. If you follow my tutorials I walk you through making sure you’re using PHP version 7 on your hosting account. You must be using a 10-year-old version of PHP which will also make your website run very slow. Nice video, I think this course related only for graduated of any computer sciences. Its easy to build a website and uploading​ videos. Do you know how to implement CNN video news page? Please let me know what plugins are proper for this. Unfortunately there isn’t a reliable solution to accomplish that. There are some video gallery plug-ins, but I find they are all poorly coded. Hello, Adam! It looks like I may be one of the ones that doesn’t have the editor under Appearances so I can make additional tweaking changes. I think that may be because I did not do your fresh WordPress install. I used inmotion‘s install months ago. Odd that they don’t offer the editor. So, does this mean that when I decide I can handle holding my courses on WP (and go ALL in and no longer build courses on Weebly), that I would have to purchase the GeneratePress pro thingie? That’s fine, I just want to know ahead of time. At this point, it would be a real pain to have to do a fresh install of WP just to have the editor feature as I”ve already started working on the site according to your videos. Am I right? I’ll just purchase GeneratePress‘s premium and let the additional editing stuff go? It is not always the host that hides it. It can also be your theme or a particular plug-in. What theme are you using? And are you using any security plug-ins on your site? Elementor, Fullwidth Page Templates, iThemes Security, LifterLMS, Lifter LMS Helper, LifterLMS PayPal Gateway, LifterLMS Stripe Payment Gateway, Lifter LMS WooCommerce, Nav Menu Roles, UpdraftPlus – Backup/Restore, WP-Mail -SMTP and finally, Yoast SEO. Actually, I think pretty much everything I’ve added has been from your courses. I will probably just let the editing go until I’m ready to go all in and will just purchase Generate Premium unless you have a simple solution for now. Thank you! On a different note, I”m assuming that I”m doing all of the work I’m supposed to be doing in the child theme of Generate Press, correct? I sure hope so! He he! Yes it’s a good idea to have the child theme activated when you start using or making any of these changes inside the customizer. It is the iThemes Security that disabled your Edit button. Go to plugin settings and look for WordPress Tweaks, Click “Configure Settings: and 4th option down is File Editor. See if it is checked to disable, mine was by default. I’m using Generate Press for my theme and I’m pretty much using the plugins you’ve mentioned in your courses including using some security plugins too. Maybe there’s one that you didn’t recommend that I picked up along the way? I’m using Elementor, Fullwidth Page Templates, iThemes Security, LifterLMS, LifterLMS Helper, LifterLMS PayPal Gateway, LifterLMS Stripe Gateway, LifterLMS Woocommerce, Nav Menu Roles, UpdraftPlus – Backup/Restore, WP-Mail-SMTP, Yoast SEO. Thank you for looking at this! Those plug-ins are all good ones. I do notice that you have multiple payment gateways in their that you might not be using with LifterLMS. I would just suggest you decide on which way you’re going to accept payments and only have that gateway installed and activated. None of this works in WordPress.. The new Plugin part of WordPress give you a list of about 20 that are either already activated or ready for upgrade.. The Generate press is not available. And there is no permalinks tab? The only reason why you wouldn’t be able to see the same things that everyone else is able to see is if your WordPress login does not have the correct permissions. Every WordPress login can be assigned permissions, typically if you set your own WordPress website up for yourself you would have admin permissions, but if someone set the website up for you they could have given you lower permissions in order to protect you from breaking your own site. Hello, Adam! Thank you for all the time and amazing effort you put into this course! I’m super excited. I already ordered InMotion hosting via your site back in Nov. ’16, I think it was. Also, I installed WP on my new site. I also have LifterLMS‘s Universe pro plan. How do we handle this? Do I need to re-upload your files and will that delete all that I have? I guess I’d have to reupload the LifterLMS Universe bundle stuff too. NOt a big deal since I’ve been waiting for your course to come out and I’ve done very little work on the site, actually none other than making sure that plugins are updated. I just want to understand what I”m doing. I”m assuming that I need to re-install everything and it will wipe everything I currently have out. I reckon I would have to get the LifterLMS keys back into the site again as I think your files will wipe all that out. Otherwise, there’s nothing to lose. I can get those LifterLMS keys back in probably relatively easily. Thank you! Well the way I provided this, the older version, would require you to download a package to restore on your website. This time around I don’t do it that way because what I found was I was robbing the people of the experience of getting comfortable using WordPress and I thought it was better to empower people by teaching them how to set everything up themselves. So if you have an existing site that already has LifterLMS on it, you can actually stick with that. You can skip to the video where I at all the plug-ins and you can continue on from there. This time around I’m using a different page builder, it’s called Elementor. It is such a fantastic page builder and you can build pretty much anything with it. The Elementor video ROCKED my world. I thought I understood Elementor‘s capabilities but I had only scratched the surface. Thanks for all the information you have shared. I sincerely appreciate it! I am happy to hear that! I will be adding additional videos on different homepage layout for this course creator video series. I’ve been excitedly waiting for this series. Currently, I’ve been building my courses on Weebly, which works, but, I want to see if I can handle learning and maintaining a course website on my own. It’s daunting as a newby, but, I want to put forth the effort. I sell online science and math courses to homeschoolers. I meant to say, I want to see if I can maintain a WORDPRESS course website on my own, just to clarify. I hear it’s can be a real challenge to maintain one as a one person band. I find that WordPress requires very little maintenance. Of course like any platform if someone leaves you a comment your going to want to respond to that and have to do bits of customer service here there, but I’m sure you’re already doing this. Happy to have you in Gloria! I know you can do this all by yourself, well with the help of my videos of course. 1. Which video explains how to back up domain from a host company and then restore it to Inmotion? 2. The child’s theme don’t show the template option where I can select full width, what could be wrong? 3. When I point or move my domain from it’s current host company to Inmotion, will I be paying for for the annual subscription with the former? 2. That is when you install and activate a plugin named full width page templates. It’s covered in the plugin video. 3. No, if you are no longer using their hosting you are only paying for the domain name, which can be $15 per year or so depending on what they charge. Hi Adam, thanks so much for your great content. After watching and working alongside your 2017 training course, I know we are finally headed in the right direction. I’ve purchased tons of themes and other resources that simply did not have the capacity to do what we needed. Starting from the ground up with your program is the way to go. Thanks so much for helping us take major leaps toward our vision! Thank you so much Virginia for saying that. I agree, and am 100% behind you and here to help you. I tried to download the resources but it keeps taking me back to the home page, how do I fix this? Secondly, I would like to use my domain name with one of the hosting companies you didn’t recommend, what then should I do? It shouldn’t be taking you to the homepage at all. I would suggest trying in a different web browser. You can use a different host, but many will be problematic. Awesome. Another browser took care of the problem. all I want is help right now as whenever I click on to DOWNLOAD RESOURCE button it redirects me to this same page again….no pop-up arise in which I can fill my email details!!! Oh it looks like you got your problem resolved. That’s awesome! Maybe try in a different web browser or in an incognito or private tab.
? for you! do you know for sure if vooplayer videos can be inserted using the thrive themes responsive video element in their content builder?? (they have auto options for vimeo and youtube and say you can also use self-hosted videos, but i wasnt sure if this would fall into that category) thanks! I think they have an embed or in HTML option. That would be the better one to choose whenever you need to embed some content. A bit off topic, but what plugin do you use to create the pop up login form for this website? It looks great. And for membership sites, it would be great if you could do a tutorial or indicate how you add the member’s avatar to the top menu. Actually I think that is on-topic because on this video series we are creating websites that people will log into. Now here is the bad news, it’s something custom to the WordPress theme that I am using. If you want to see the being that I’m using, it’s called newspaper and I have a link in the footer of my website for you to see it. I’m stepping out from the internet shadows! I’m in! Your tutorials are mesmerizing. Awesome content. Thank you. I tell you, I had to do the same thing. Step out from the Internet shadows myself. Here I am three years later and I’m so happy that I did that and this is exactly what I want for you and for everyone else. To take what you have a new and share it on the Internet with other people. Good for you! Let me know if there’s any help I can provide. You have to first make sure you have installed the parents theme as demonstrated in the video. I will start posting more videos starting tomorrow. Hi Adam, Great Tutorials. I am setting up my course website and I am super excited with these tutorials. Thanks for everything you do. One Problem though, I am not getting the same lesson layout as you shown in the introduction video. I am not able to embed video in the dark background as you shown. I know somewhere I am missing. I went back and forth in the tutorials but I can’t find the solution. Can you help? Did you install the child theme from the resources package? If so there is a page header feature where you would put your embed code and choose the color of the background. I haven’t made a video on that yet but it should go up this week. I went through a created a home page along with your video. It was very informative and helpful. I feel like I have learned a great deal and am so grateful for your tutorial. I still feel like I like and prefer your other home page design (the masculine one) for my purposes anyway. Is there a way to import that page and then customize it to my needs? I’ve completed most of the course, but would like to change to the other design. Thanks so much for your help. Yes I would suggest that you re-download the resources file because I made a couple edits to the other two homepage styles. Also some people were having some problems importing them. So go ahead and re-download that and then import the homepage that you want. Then you can begin editing it to make it look exactly how you want it to. Hi Adam. Where are the videos for setting up lifterLMS? They are on the way. Much of it is self explanatory, but I am going to go into everything in detail. Many of the videos are recorded, just need time to edit and upload. I just need a few days. I actually resolved my own problem. Missed a step because I was too excited. That’s great to hear Steven. When I try to install the theme provided from the resources here I get an error message stating, “The package could not be installed. The theme is missing the style.css stylesheet. Just make sure you install GeneratePress, then the child theme. Hi Adam, I already have hosting with one of those “other” not-so-great companies. I want to switch to InMotion after the first of the month. Is it difficult to transfer my domain over? Anything I need to know ahead of time? Thank you. Well I assume your domain name will stay with the existing host until it is about to expire, then you can transfer it out. So what I usually do for folks, is make the necessary changes to point the domain to InMotion Hosting, to make the process easier on you. Thank you for replying. I have my domain name through GoDaddy, and my hosting through HostGator on a month to month basis. Since I paid for a year of my domain name, I think I can transfer hosts anytime, but I’m not sure. Maybe just have to change CPanel settings. This is all kind of new to me. Also, if you haven’t already recommended it before in your videos…one thing that I learned really quick! When a person buys a domain name, DEFINITELY pay the few extra dollars to keep your contact information “private”! OMG, I had probably 7 solicitation calls a day after I bought my domain and many were (I don’t know the right term) “phishing”? attempts…pretending to be FROM my host trying to get my credit card info. :/ One big giveaway is that they had thick Indian (?) accents. Yes so in this situation it would be really easy to sign up for a new web hosting account with InMotion hosting and then point the domain name that you have added Go Daddy to InMotion. I can help you with that is needed. Now what you can also do is create a cPanel backup on Hostgator and then upload that to your new InMotion hosting account. Then what you would do is submit a support ticket asking them to restore that. I do have a video on making the backup and uploading it to InMotion. Please I need that Video on how to go about the back and and upload to In motion. Again, when you move your domain from one host company to another, do you still need to be paying for annual subscription to the former? You are the third person to tell me that, so there must be a problem. I will email you personally. Actually I think I just found the problem, you downloaded this already in an email was sent to you on February 21. My system has measures in place to not email someone the singing thing twice. You still have access to that email so that you can click on the download link in it? There is no need for that. All you have to do is head over to the generate press website user forums and do a quick search, and you get the instructions on how to change it via function. Also if you go to generate presses website and look at their documents you will find instructions there as well. Amazing video tutorial.I am also building an online course website but i don’t want the user to be redirected to the purchase page. My course is free for all.If you can suggest me the workaround that after login the user is directed straight towards the course. So you don’t even want to have them register for a course? You don’t have to charge for your courses, but it’s perfectly acceptable to have someone enroll in the course. Also you can mark individual lessons as free, so in this case you can mark them all is free if you want them to bypass the enrollment into the course. Thanks for the the great video tutorials. When will you make the resource files for the latest online-course builder available? Looking forward to building my own course platform. The download button is right here on this page, did you not see it at the top right underneath the videos? Actually I did download ( twice) but for some reason the resource folders were empty – so I figured the files were no longer available! I have done a download now and everything’s there. Will check it out over the weekend. Once again – thanks a million & keep up the great work Adam. Wow, thats odd that that happened with your download. Glad its all good now though! I was able to download the resources – but there is no All-inOne-WP template file that I can import. The files that did download are the child theme, LifterLMS Stripe extension, GeneratePress Child themes, some images & Elementor Page Templates. There’s no sample courses etc. I’ve tried the download several times now – from both the 2016 & 2017 Course builder resources & get the same results. Would appreciate it if you could email me the required resource file. That is the way the 2016 version worked. The 2017 version is entirely different. If you watch the videos in the video series you would see that. I want everyone to use the new 2017 version and not the 2016 version. There is no benefit really to using the 2016 version. What is the reason you wanted the 2016 version over this new one? Let me see if I understood correctly your answer. Do you have Mautic hosted in InmotionHosting.com and you don´t have any problems for send emails from there? and You use Vooplayer as video hosting and also as a video player? Hey Nicholas, yes that is correct. Now regarding Mautic, I do have videos on my other YouTube channel on how to install it however they are a little outdated. I’m currently working on creating an entire video playlists identical to the quality of the playlist for my course creators, but realistically that won’t be available until next week. In the video training for it I will be using InMotion hosting and setting up outbound email sending via the email account that you create on your hosting account and Amazon SES. The better method being Amazon SES. And yes that is what I use for my video playing. VooPlayer does provide some video hosting storage capacity but is limited to 5 GB. That being said most video courses if properly optimized, don’t really take up that much space at all so I guess it would be adequate. Great! Soon, I will buy your InMotionHosting special offer. Thanks again. Only 2 questions: 1- Best autoresponder? 2- Best private video hosting? Hey Nicholas, best is subjective unfortunate. For example I personally use Mautic, which is a self hosted marketing automation platform. I love it, its free, its powerful, but some people would prefer not self hosting, so in those cases ConvertKit is the way to go. Video is the same dilemma. I use VooPlayer, but for many Vimeo is just easier. I compared the price of using self hosted Mautic vs the commercial competition. The cost is not free. The cost of Mautic – if you use Amazon for email services – is about half the cost of email marketing services such as MailChimp. It is a good bargain. The primary problem I have with it is the lack of documentation and glitches since it is not as well known or widely used as the commercial services by regular people. Your videos for Mautic are a great help. Actually I would like to challenge your math here. To calculate the true cost depends on how many emails you will send. So with a traditional email service you pay per month regardless of if you send any emails, your pain based on how many contacts you have. With Mautic you don’t pay for anything except you do need a way to send the emails and if you’re going to send a large quantity of emails it’s best to use a transactional email service. So for example you can use SparkPost to send up to 100,000 emails per month free. If you choose to use Amazon SES it will cost you $0.10 per 1000 emails you send. Now also keep in mind that Mautic is a marketing automation platform, it is more equivalent to Drip. Now go take a look at Drips pricing to put things in more perspective.